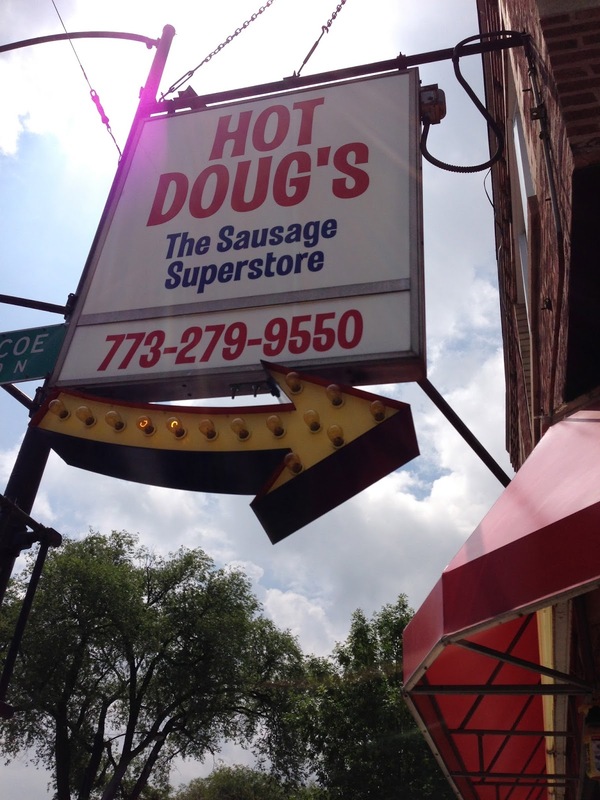 Whenever I mention the word hot dog in Chicago, everyone always suggests Hot Doug's. And for years, I have been meaning to try it out. Finally, I made it to this self-proclaimed "Sausage Superstore." While waiting in a short line (we arrived about 15 minutes after they opened), we looked at all the different wild game options and also other creative hot dog combinations named after celebrities. Some of the game meat included buffalo, alligator, and duck. It is difficult to decide, so I took some advice from one of my buddies... order one "weird one" and one "normal one." Choosing between the game sausages was the most difficult part, but once the food order arrived, we knew made the right decision. The service is very friendly and pretty fast. They clean up after you, so just leave the trays on the table. Upon first bite of the game meat, I fell in love with the restaurant. Great food, great atmosphere, memorable experience... I instantly thought this is going to go the distance. However, I was surprised by an inaccurate Chicago-style hot dog that was more awful than it was great... and for that reason, a 4 mile rating was all I could give. The first sausage we decided to split was the "game of the week." It happened to be a smoked buffalo sausage that was made with both red wine and bacon. It was topped with a roasted red pepper dijonnaise and plenty of smoked gouda cheese. The buffalo sausage was on the leaner side, not leaving that fatty residue behind. The red wine and bacon were both very subtle which was pleasant to the palate. I thought it needed a little more of the red pepper dijonnaise which I believe was a combo of both dijon mustard and mayo. The cheese was definitely overdone. Smoked gouda has a very strong smokey flavor which actually overpowers any other flavors. Scrape some of it off if you want to actually taste the sausage. My buddy and I shared the crayfish, or what I call crawfish, sausage also. This sausage was made of both crawfish and pork and topped with a cajoun remoulade, jarlsberg cheese, and chunks of crawfish for an added garnish effect. Upon first bite, an extremely fishy flavor was encountered. I mean, it tasted like crawfish, but it was a little more overwhelming than I expected. I still really enjoyed the creaminess from the cheese and the sausage as a whole. The cajun seasoning was nice. However, I will say that I doubt many people will like this option. Like I said, fishy is the main flavor, so just be aware. This Chicago-style hot dog singlehandedly kept Hot Doug's from reaching perfection on my blog. And it was bad enough that I dropped it an entire 1 mile rating. Their version of this Chicago classic is made with your choice of char-grilled or steamed dog that is topped with mustard, CARAMELIZED oninion (awful), neon green relish, tomato, pickle, and celery salt. Why caramelized onions? It makes everything too soggy. And, they don't consider sports peppers as a normal topping? This is absurd. I was so disappointed that I even forgot to take a picture of the hot dog. But maybe that will remind you to not order "the dog" at Hot Doug's. But, at $2, it can be a filler. This may be one of the best deals in the city. For $1.50, you get an all-beef hot dog that is dipped in corn meal batter and deep fried... aka a corn dog. They come out golden brown and crispy. Just add a little mustard or ketchup (whatever you prefer) and enjoy. Can't really mess this up, unless its burnt. So be aware that the french fries order is HUGE. The large is way too many for two people. Sometimes I wonder why obesity is such a problem in America... then I see an order of fries that is just outrageous. At $2.25, it is definitely worth it. The fries are hand cut, extremely crispy, and not as oily as I was expecting. Great side, but I would rather have a corn dog to act as a filler. - Do come on the off hours. Otherwise you will wait in line for easily 30 minutes or longer. It is sort of ridiculous but everyone loves this place. - Share an order of large fries... it is big enough for 3 people if not more. - Parking is difficult so reduce the number of cars if possible.